Allows you to properly run 12V DC Accessories off of high voltage DC systems. Allow an extra week delivery time. IDC-200C-12 is the perfect high efficiency 200 Watt isolated DC-DC converter suitable for applications requiring galvanic isolation between the input and the output. 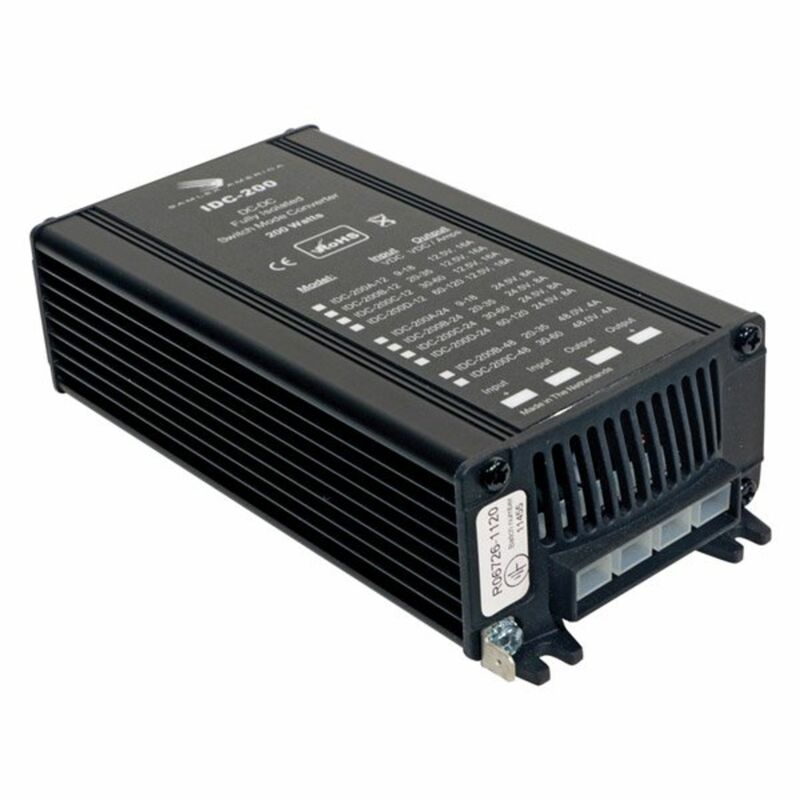 The IDC-200C-12 isolated DC-DC converter provides a highly regulated output DC voltage of 12.5 Volts for an input DC voltage range of 30-60 Volts and rated output current of 16 Amps (at 60 Volts input). Features of this isolated DC-DC converter include compact housing, fold-back current limiting and protection against short circuit, overheating, over voltage and reverse polarity connection. The unit comes with push-on flat blade, quick disconnect connectors. IDC-200C-12 isolated DC-DC converter is EMI/EMC compliant and conforms to European standards EN50081-1 (for EMI) and EN50082-1 (for EMC). Typical Applications include, Electric Vehicles, Heavy Equipment, Trucks, Buses, Marine Vehicles, CB radios, 12 Volt lighting systems, and AM/FM sound systems. Do you own the IDC-200C-12? Please, tell us what you think about it. It helps us provide you with better products. Please note that it may take up to 72 hours for your review to appear.